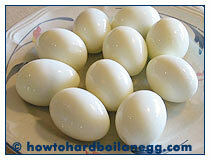 Do you need information on how to hard boil eggs? If yes, then welcome to this site! The purpose of this site is to provide comprehensive information for cooking hard boiled eggs for use in your favorite recipes. Hard-boiled eggs can be eaten plain with a bit of salt & pepper, used in egg salads, for making deviled eggs or can even be cooled and sliced then added as a topper to your favorite salad. If you have small children, have trouble lifting heavy pots, or are otherwise concerned with working around boiling water, I would suggest buying an egg cooker. Please visit my egg cooker page for more information. Lastly, I can assure you that you are not the only person with questions on how to boil an egg. I receive many questions on this topic from my other cooking sites, which is the reason why I have created these pages.